We love Honest Kids juice in this house, but let’s be real, the shelf price is ALWAYS higher than other brands and it doesn’t go on sale as often. But this is a great deal on Amazon! I’ve purchased it around this price before. It’s a LOT of juice and it comes right to your doorstep! 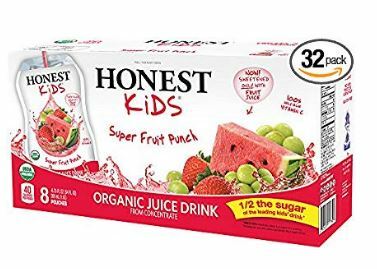 Honest Kids Super Fruit Punch Organic Fruit Juice Drink, 6.75 fl oz, 32 Pack is priced at $13.56 BUT there is a 20% off coupon to clip also, bringing your price down to just $10.85! That’s just $2.71 per 8 count box or $.34 per juice! This is a Prime member only deal. Other flavors are the same price if you don’t want fruit punch. Previous post: Walmart: Clean and Clear Face Wash only $1.57 after Ibotta!